For many years the Law Office of Lainey Feingold has been keeping track of Talking ATM installations in countries all over the world. On September 10, 2011, Google’s “Talking ATM alert” brought news of installations in Mumbai India. The full article, reprinted below, is from the Hindu Business Line. Read the article posted below on the Hindu Business Line website. Talking ATMs for the Visually Challenged! Mumbai, India (September 10, 2011)– “This is the first time that I have seen the world through the eyes of a visually challenged person and it’s an experience that I will never forget,” said a participant at Antarchakshu, an event organised by the Xavier’s Resource Centre for the Visually Challenged (XRCVC). From buying groceries, playing foot ball and even withdrawing money from an ATM, participants were blindfolded and put through a maze of daily chores by the Xavier’s volunteers, to sensitise people on a day in the life of a visually-challenged person. In fact, the highlight of the event was the talking ATM for the visually-challenged which was displayed at the college. “There are partially talking ATMs which have been deployed in many banks, but they are useless for us as they say the bare minimums like – welcome and thank you,” said Sam Taraporevala, Director of XRCVC who is also visually challenged. The visually challenged need an ATM that can guide them properly. We have developed a software which will ensure that the visually impaired can operate the machine themselves keeping in mind safety of the transaction. — Nagesh M Nayak, Partner – professional services, NCR . The company has been developing these specialised machines for different banks. Many of them have deployed these machines on a pilot basis. 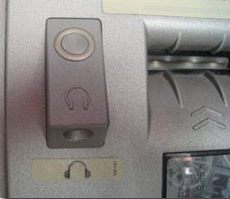 Each ATM has headphones attached to it so that the visually challenged can hear the instructions and fill in the required data. “The labels on the ATMs are written in Braille. There is also an option to blank out the screen as a safety mechanism to ensure that no bystander misuses the pin,” said Nayak. Although the ATM manufactures were tight lipped about the banks they were supplying their machines to, they were hopeful that the they would be deployed by the banks soon and visually-challenged customers would truly benefit. Below are a few of the many Talking ATM resources on LFLegal.com. If you would like to receive notice when new Talking ATM information is posted on this website, please use the Contact Page of this website to let us know. You can also Follow the Law Office of Lainey Feingold on Twitter for up-to-date information about Talking ATMs and other accessible technology and information. For more information about Talking ATMs generally, visit the Talking ATM FAQ on this website. Read the first Wells Fargo Talking ATM press release. Learn more about the early history of Talking ATMs in the Talking ATM History Category. This post is about Talking ATMs in Mumbia India. These ATMs allow blind customers to independently use an ATM. The companies that make Talking ATMs in India also make them in the United States.